Well I said I was going to start doing this on a more consistent basis, so here I am attempting to do just that. Today I wanted to explain the importance of theology to faithful Christian living. I hear many (far too many) Christians say things like, “theology is for academics,” or, “theology isn’t as important as how you treat people.” These statements are things that make my skin crawl and in honesty make me scared for the Church of the future. Where have I heard Christians saying this? Well I hear this everywhere, mostly from lay people who don’t understand it or are too lazy to learn it (I call it how I see it), but a shocking source that I have heard this from lately are people training to be ministers in Christ’s Church. Yes, many want to use “life change” as the soul marker for whether a person is being worked upon by the Holy Spirit instead of who that person becomes. This means the whole person, so that they are transformed not only in what they do but in how they think and what they believe. Behavior modification is something that anyone can do; Muslims do it, Jews do it, Buddhists do it and so on, so if behavior modification is the push and point of Christianitym than how is it different from any of the faith systems mentioned above? How do we know it to be true over the other major religions? It’s no wonder that so many people find themselves scratching their heads wondering why it feels like something is missing from their lives as if the void that was there previously continues to go unfilled, void of purpose, meaning, and identity. It is no wonder postmodernists proclaim relativism as the new norm for determining truth! So what makes Christianity different, unique, or dare I say it, real? It is not its behavior modification, it is not the rituals, or the obedience to rules of faith. It is in its theology and worldview that Christianity unique, without these things Christianity ceases to be. What Christ has done for us is a completely unique action in all of human history. This action therefore is worth proclamation both in how we live and in how we think. Christianity is intrinsically different, it is at its very heart; personal, intimate, and best of all, real. So then how is theology important, how does it play into this little thought experiment we have embarked upon? To begin it might be wise to define the word theology. Theology is any and all talk about God. The word theology comes from an amalgam of the Greek words theos and logos literally meaning, “words about or regarding god(s).” What is interesting here is that if any “words” about God are what we term theology, than every human being is a theologian. All of humanity can and does say something meaningful about God making our words important. This is why focusing on how we talk about and think about God has an impact on our daily lives, especially for Christians. So now that we have a working definition the next question is why should I really care? 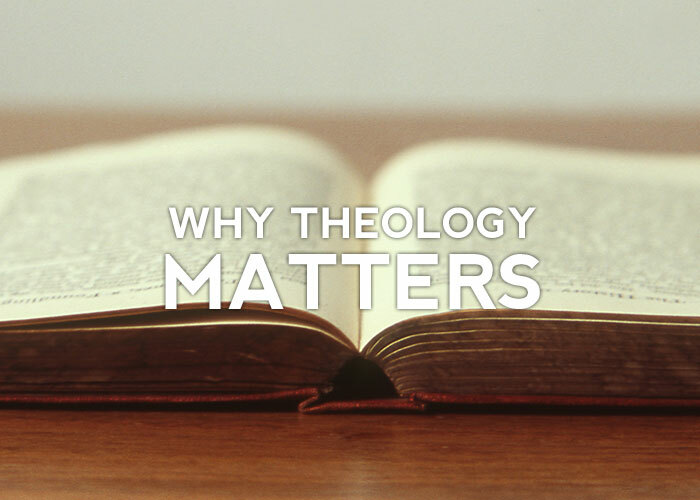 Many mistakenly believe theology to be something done by those only trained in theology. However if the definition above is true (and I believe it is) than we are all doing theology, every minute of every day. If this premise holds true, than is it not worth the effort to speak, write, and think of God as he reveals himself to us, instead of conjuring a being in our minds that makes sense to us? Is it not required if we are to worship God as He is? The obvious answer is a resounding yes! To worship a God created in one’s mind with some Scripture thrown in is not to worship the living God of the Bible but to worship a god of our own making and therefore an idol. So it appears that theology becomes quite practical indeed as it is theology (words about God) that is the base of our faith. When a person comes to Christ and begins to come to know God, how they think, perceive, and understand the world changes. This renewal of the mind will be practical, real, and noticeable. It will lead to a person acting, thinking, and being different. Giving people a list of rules, or applications will never accomplish this task because it is devoid of the Holy Spirit. Does this mean that it is better for a person to read a book or get into pointless debates regarding issues like free-will and determinism rather than feeding the poor, of course not. What it does mean is that understanding whom God is through the Scriptures and theology is just as important as feeding the poor. God is worth our time to come to know in fuller ways so that we may reflect Christ in a faithful way to the poor we feed, and the broken we care for. This is why theology cannot be sidestepped and ignored, because it is at its very heart foundational to our faith. Without it, we cannot know God and to not know God is to deny the very purpose of the cross. This is what every person unknowingly does when they declare theology unnecessary or obsolete. They alienate themselves from God and declare him unworthy of their time. Yes, doing things does appease God, but doing things apart from relationship with God can never lead to reconciliation, or transformation, or salvation. It will only lead where all other religious practice leads, destruction. Peace and Blessings and as always thank you for reading.